I dont like pesto that much before, dunno wat happened to me suddenly i started loving this herbs based sauces for pastas very much that too the basil pesto is my recent favourite. Eventhough we get tons of store bought pestos here, i love to make myself my pestos at home. Here comes an another interesting pesto which i picked from Martha Stewart space, i just loved this pesto,not only me my whole family suddenly became pesto lovers. 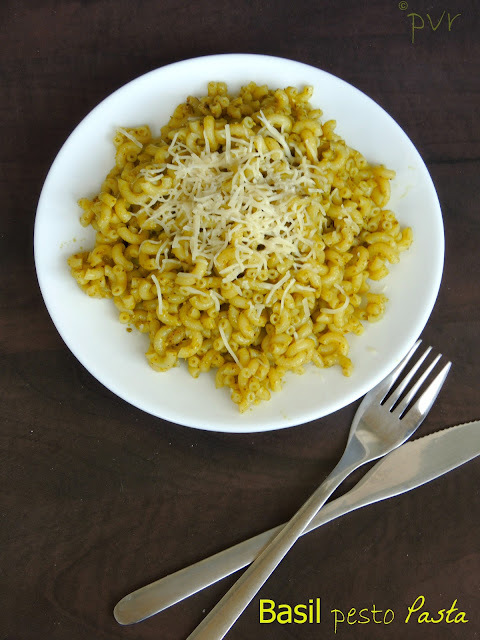 This basil pesto pasta is definitely a quick,simple,obviously very flavorful, very nutty and filling dish, you can prepare it in a jiffy and am sure everyone will definitely enjoy this super delicious pesto pasta.Sending to Flavors of Cuisines - Italian event guest hosted by me,event by Julie. Bring boil two cups of salted water, drop the basil leaves,within few seconds drain them and let them cool completely. In a food processor, take the nuts,basil leaves,garlic,salt,pepper,process until the nuts are finely chopped. While the machine running, pour the oil and grind until smooth. Transfer the pesto to an air tighted box. Add enough pesto the cooked pasta and serve immediately topped with grated cheese. Enjoy with some grilled meats or a simple omelette. Tiramisu is a well known Italian dssert and the word tiramisu means pick me up or lift me up,this dessert is made with ladyfingers bisucits aka savoiardi, dipped in coffee and layered with whipped mixture of egg yolks and mascarpone cheese, flavoured with wine and cocoa.Actually its really hard to imagine tiramisu without eggs, that too the savoiardi biscuits its quite a challenging bake without eggs. For our this month's of Eggless Baking, Gayathri and Sowmya of Nivedhanams suggested honestly challenged us to make this incredible Italian dessert. Initially i was planning to make an eggless cake for making this layered tiramisu, but while discussing Gayathri was saying that it will be different and more challenging if we could make a eggless ladyfingers aka savoiardi biscuits. Then i went on searching and finally i got an incredible eggless saviordi biscuits from Aparna's space. After going through her post, seriously i boosted myself and prepared some eggless saviordi biscuits. Instead of making tiramisu in a round serving dish, i went for individual servings. 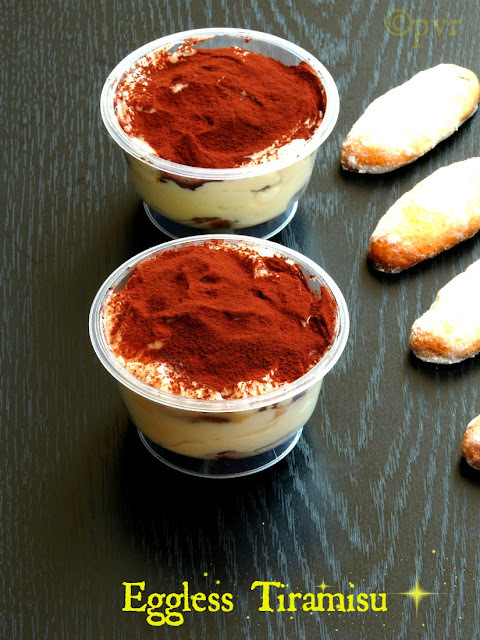 These individual servings are really amazing and we really enjoyed thoroughly this medium sized individual tiramisu. Eggless tiramisu turned out extremely prefect.Eventhough these eggless ladyfingers dont have that super soft like texture of the regular lady fingers biscuits,they tastes exactly likesuper nutty shortbreads. I kept my tiramisu for almost two days in fridge to make this biscuits a bit softer.By the way dont expect that these ladyfingers will turn super soft as like those lady fingers biscuits with eggs. Today is our last day of a month blogging marathon, seriously i enjoyed running this long month and since this week is misc week, am posting some recipes for few events going around this virtual world.Sending to Flavors of Cuisines - Italian event guest hosted by me,event by Julie. Check out the Blogging Marathon page for the other Blogging Marathoners doing BM#27. Beat the sugar and butter,vanilla extract for few minutes, add the flour anf coarsely grounded nuts, make a semi solid dough. Transfer it to a piping bag,and pipe it over a baking sheet lined over a baking tray with enough spaces. Or else grease your hands and make oval shaped biscuits, arrange over a baking sheet,with enough spaces. Bake them in 300F, for 30-40minutes until they turns slightly brown at the edges. Take out of the oven and cool them in a cooling rack, once they are slightly cool,roll them in powdered sugar. Store in an air tightened box and use when required. Heat water in a wide skillet, reduce the heat to simmer. In an another vessel, take the cream and place it inside the water simmering skillet. Stir the cream and after 15minutes, add the lemon juice and continue heating, until the cream curdles. Whipping cream will become thicker and it will cover a back of your wooden spoon, you can see just few whey and remove the bowl from the water,let it cool a bit. Line a siever with dampened cheesecloth and keep them over a bowl, transfer this mixture to the lined sieve. Dont squeeze the cheese or press,once cooled completely cover it with a plastic wrap and et them sit in for a day. Next day you can see ur super luscious,creamy mascarpone cheese. Chill the whipping cream and bowl by keeping in freezer for few minutes, whisk the whipping cream until it reaches stiff peaks with a electric hand mixer. Put the cheese, sugar in a bowl, whisk it for a while, now fold the whipped cream to the cheese mixture. Dip half of the eggless ladysfinger biscuits in the cold coffee, turn both sides, soak for few minutes. Arrange the biscuits in a single layer in a round serving dish or in individual cups. Spread enough cream in a uniform layer covering the biscuits completely. Dip again the eggless ladysfinger biscuits in the cold coffee and arrange over the already prepared layer. Spread evenly again remaining cheese, sift the chocolate powder over the cream cheese. Cover those individul cups with a plastic wrap, place the pan in fridge, keep atleast for 2days..
Been born and brought up in South India, pongal is one of the my most favourite breakfast before few years,but i cant eat this food now for my breakfast coz i completely lost the habit of having South Indian breakfast dishes. Blame the Paris's weather or my laziness, watever its been ages i stopped making pongal for our breakfast.If we crave for this beautiful dish, i'll definitely make it for our dinner, obviously most of the South Indian breakfast dishes are now turned as our evening dinner. 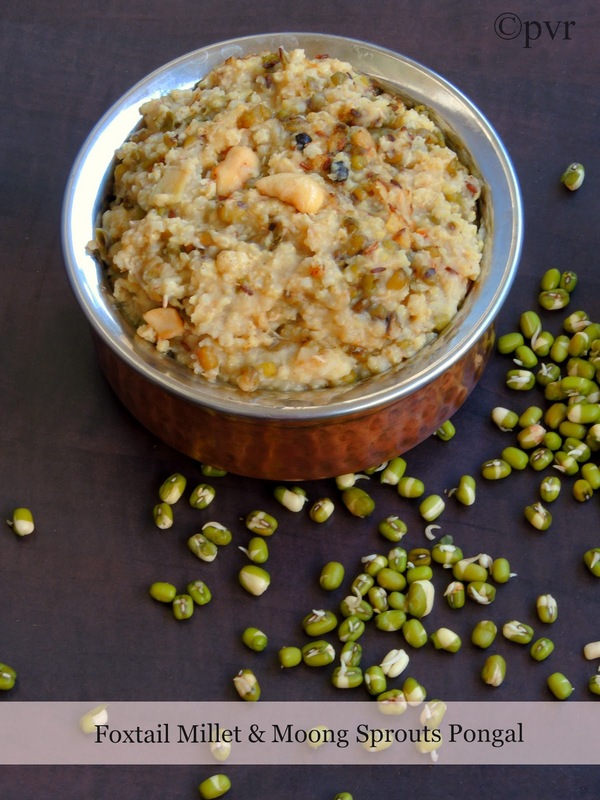 Recently i tried this super healthy pongal with foxtail millet and sprouted whole green gram, i was bit skeptical about this combo and tried a small quantity. But for my surprise they turned out extremely delicious and i finished myself that small quantity of pongal. Again after two days, since i had some sprouted whole greem grams, i prepared again this pongal for my whole familly and served this nutritious dish with spicy coconut chuntey..
Wash the foxtail millet and sprouted moongdal together. Take them in pressure cooker with three cups of water, ginger,asafoetida powder and salt, cook upto 3 hisses. Once the pressure is released, add the tempered spices, cashews directly to the pressure cooker, toss them well until everything get well mixed. Life is getting more interesting now, got a bunch of good friends aka well wishers in this immense virtual world, am thanking god everyday for showing them to me finally. Blogsphere is an incredible virtual world where we can cross all types of peoples but sometimes for our surprise you can meet few rare persons with same thoughts and characters as like yours. Thats really wonderful to chitchat with those peoples and share your daily routines to them and vice versa. Am loving this virtual friendship, eventhough we are living many miles apart the bond between us is getting more stronger and stronger everyday. 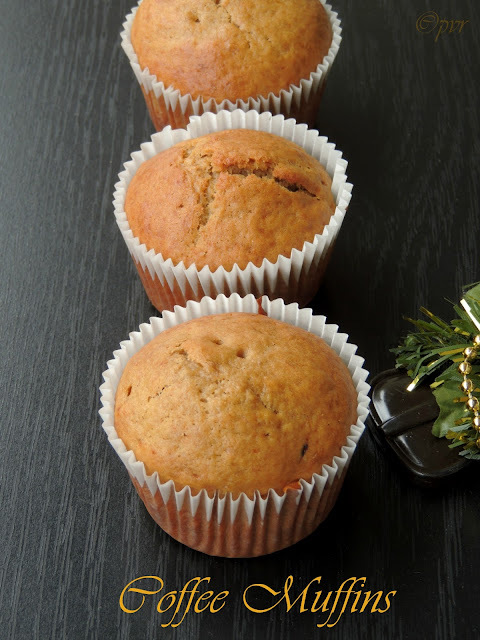 Today am posting this coffee muffins i baked from one of my best buddy Sangee Vijay's space. Have you ever visited her Spicy Treats if not, am sure you are missing something. 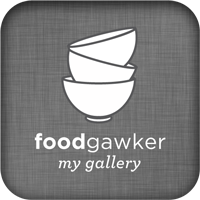 Do visit her space friends and am sure you will feel really comfort after seeing all her foods she shared with us. Actually Sangee's coffee cupcakes tempted me to make some and i prepared them as muffins as i dont want to make the expresso buttercream she went for this bakes. No matter whether its a cupcakes or muffins, these muffins are seriously tremendous,super spongy with a beautiful coffee flavour. Preheat the oven to 375F, line the muffin mould with paper liners. Put the coffee granules in a small bowl,add the boiling water and stir until dissolved,keep aside and let them cool. In a bowl sift the flour,baking powder and keep aside. In a mixing bowl,take the butter, sugar,beat it well, add the eggs and beat again. Add the flour mixture and beat for few seconds, now add the dissolved coffee, yogurt, beat everything for few more minutes until everything gets well mixed. Spoon the batter to the already prepared pan. Bake them for 15-20minutes or a skewer inserted comes out clean. Enjoy these muffins with your favourite drink. Most of our dinner goes for parathas or rotis, my kids just love rotis with anything. Obviously rotis is one of the staple food at our home after rice. I can feed easily everyone at home with stuffed parathas. I can go for anything for stuffing,none will bother about the stuffing,even if i'll go for bittergourd stuffing,am sure they will enjoy their parathas, needless to say now how they will enjoy having parathas. By the way, am yet to make that bittergourd stuffed parathas and i dont have any idea how those bittergourd parathas will tastes. Coming to today's paratha post, i prepared the stuffing with grated carrots and cooked moong sprouts, which i spiced simply with onions,greenchillies,garam masala powder and chaat masala. This paratha doesnt even need any side dish to enjoy,the stuffing itself will replace the side dishes usually we make for rotis.An another nutritious,very healthy parathas to enjoy without any guilt. 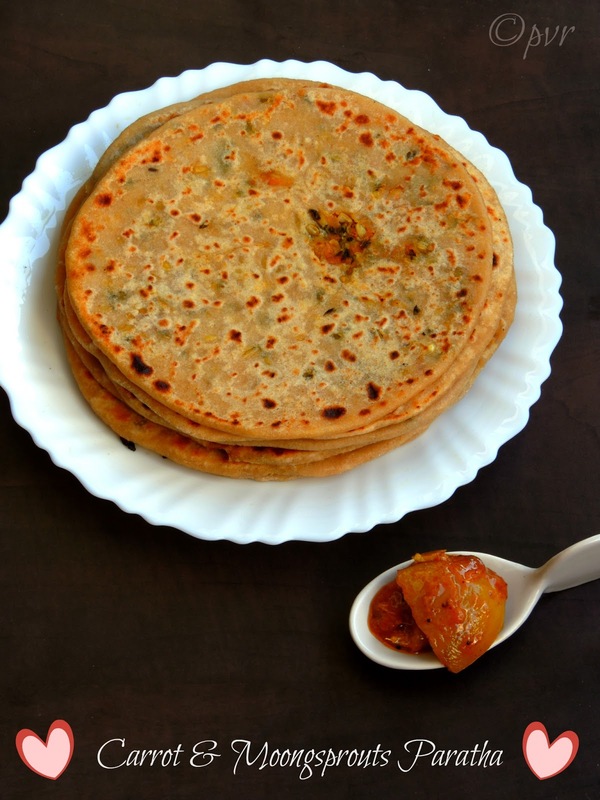 This stuffed parathas was big hit among everyone at home and we loved it. Check out the Blogging Marathon page for the other Blogging Marathoners doing BM#27.Sending to my own event Healthy Diet - Cooking with Sprouts guest hosted by Roshni. Take the cooked sprouted greengram,chopped green chillies,garam masala powder,chaat masala and salt, mix everything well and keep aside. Saute the chopped onions,grated carrots with enough oil and add it to the already prepared sprouted eengram mixture,mix well. Make medium sized balls from the dough, flatten them as small circles with the rolling pin. Drop enough carrot-greengram masala and cover the masala by sealing the edges of the flatten dough. 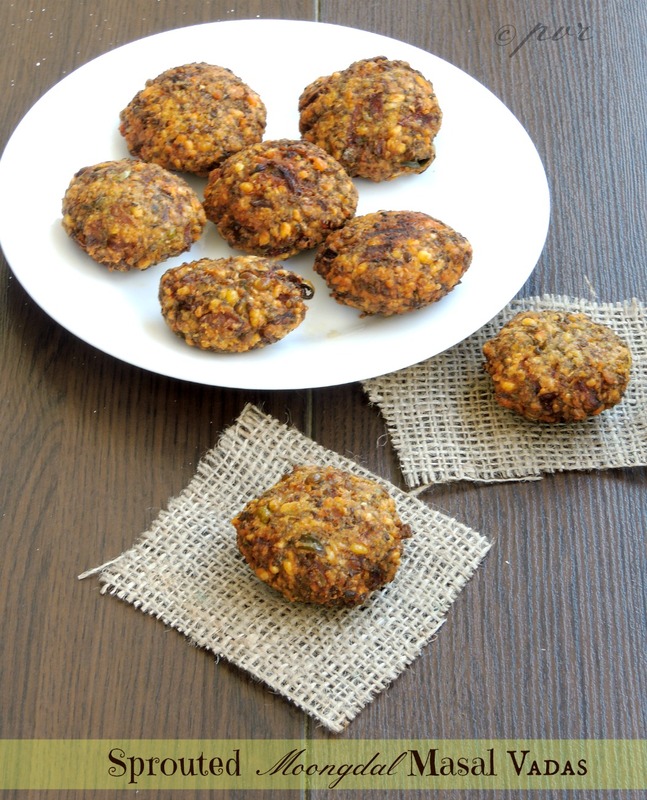 Have you ever tried making cutlets aka tikkis with sprouts?? if not you guys have to make some. Two days back, i pressure cooked some sprouts for making sundal for my evening snacks, but unfortunately they turned out super mushy.Instead of making a dal curry with that mushy cooked sprouts, i quickly cooked some potatoes and turned those mushy sprouts as this super crispy cutlets.They turned out extremely delicious and highly addictive. I served this crispy cutlets with sweet chilly sauce for our snacks and my kids enjoyed these sprouts cutlets thoroughly. 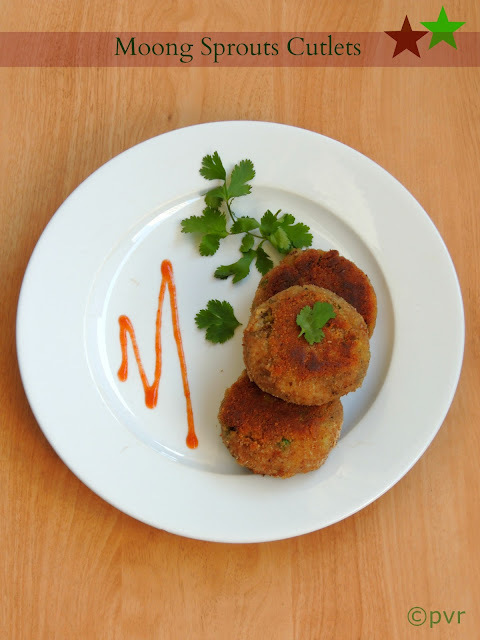 If you have some sprouts at home, dont forget to give a try to this nutritious cutlets. Making cutlets with sprouts is definitely a best way sneak this nutritious sprouts and quite an easiest way to feeds kids. None will notice the addition of sprouts in this cutlets coz those mushy sprouts bind very well with the cooked potatoes and this cutlets tastes almost like our usual aloo tikkis. Hope you guys arent bored of my non stop sprouts based dishes, sorry guys am catching up with some food events i really want to be a part.This is my fourth post for this misc week of blogging marathon, also check out the Blogging Marathon page for the other Blogging Marathoners doing BM#27.Sending to my own event Healthy Diet - Cooking with Sprouts guest hosted by Roshni. 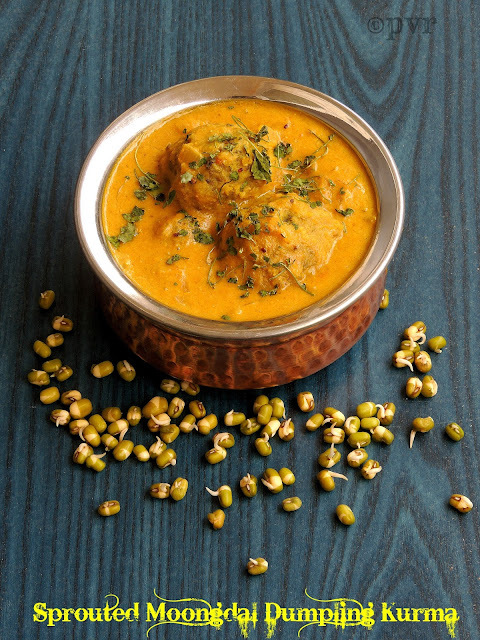 Combine the cooked sprouted greengrams, cooked potatoes, garam masala powder, fennel seed powder in a large bowl. Meanwhile heat few drops of oil and saute the chopped onions, chopped green chillies and curry leaves until the onions turns transculent. Add this cooked veggies along with the already prepared potato-sprouted greengram mixture. Mix everything well along with enough salt, make small balls from this mixture,flatten them and keep aside. Make a white paste with cornflour and enough water, dip the flatten cutlets, roll over the bread crumbs. Heat the oil for shallow frying,drop gently the already prepared cutlets and fry on both sides in medium flame until the crust turns golden brown.. Enjoy with ketchup for evening snacks..
As i told earlier, i prepared some moong and channa sprouts at home, also guys i have already today that this week is somewat going to be a sprouts week here.Yep you will be able to see some sprouts dishes i cooked in my kitchen with homemade sprouts. My today's recipe is tawa channa, recently i crossed this dish at Tarla Dalal's space and bookmarked it immediately. Once am done with chickpeas aka channa sprouts, i prepared this healthy tawa sprouted channa yesterday and enjoyed with some rotis for our dinner.Eventhough Tarla dalal suggested this tawa channa for snacks, they sutis prefectly as side dish for rotis too. Since i used sprouted channas,needless to say how nutritious this dish is. 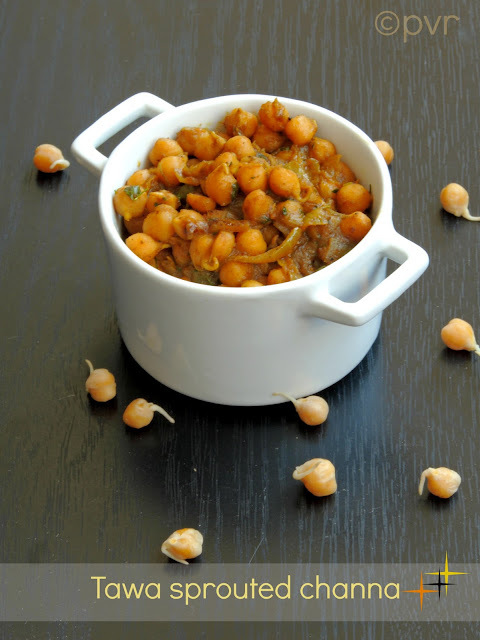 Dont worry if you dont have sprouts,you can use very well the soaked and cooked chickpeas for making this wonderful dish.With wonderful flavours, this tawa channa gets ready very much easily and even i loved this tawa sprouted channa with rice too. Now the choice is yours and make some tawa channa when time permits. Sending this vadas to my own event Healthy Diet-Cooking with Sprouts hosted by Roshni and to Only Legumes guest hosted by Nalini,event by Pari.This is my third post for this misc week of blogging marathon, also check out the Blogging Marathon page for the other Blogging Marathoners doing BM#27. Heat the oil in a pan, add the onions and saute for few minutes. Add the ginger-garlic paste, tomatoes and cook in medium flame. Add some water and cook for few more minutes. Add the chilli powder, green chillies, turmeric powder, coriand powder, cumin powder,tandoori masala powder, chaat masala, dried mango powder,few chopped coriander leaves to the cooking veggies. Add some water and cook everything for few more minutes. Add the dried fenugreek leaves,sprouted channa and salt and cook again for few more minutes until the chickpeas gets well coated with the spices. Add the coriander leaves and put off the stove. Usually i'll make sprouts at home mostly with green moong and very rarely with chickpeas, these both are my favourite legumes for sprouts. Few days back, i prepared sprouts with a kg of green moongs, obviously most of my next posts will definitely have moong sprouts in it. Sorry guys i cant help you all here coz i seriously want to send my entries to my own event Healthy Diet - Cooking with Sprouts guest hosted by Roshni. If you guys would have prepared anything with sprouts,dont forget to send your entries to Roshni. Sprouts are quite rich in proteins and definitely have many healthy nutritional values. You can make sprouts with any legumes but somehow i feel comfortable with both moongdal and chickpeas. Coming to today's post, its a healthy kurma i prepared few days back with sprouted green moong,they turned out extremely delicious and goes awesome along with rice and rotis. We had this kurma for our lunch and had the same kurma for our dinner with chappathis. 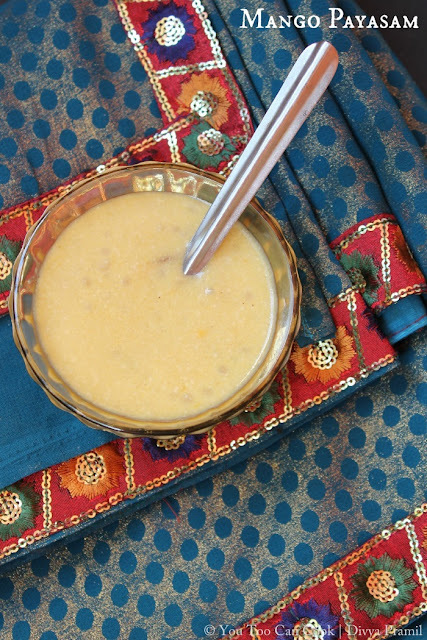 If you have sprouts at home give a try to this kurma,am sure you will love it. For this week of blogging marathon, am catching up with some food events as misc theme and obviously am sending this healthy dish to my event.Check out the Blogging Marathon page for the other Blogging Marathoners doing BM#27. Grind the sprouted green moongdal as bit coarse paste. Fnally add the chopped coriander leaves,grated ginger and salt, mix everything well..
Make small lemon sized balls from the grounded paste and steam cook them for 10-15minutes in an idly cooker..
Heat enough oil in a kadai, add the bay leaves and fry until they turns brown. Add immediately the chopped onions, chopped tomatoes,slit opened green chillies, ginger-garlic paste and saute everything well until the raw smells goes away. Cook everything in simmer for few minutes with coriander powder,garam masala powder,turmeric powder,grounded paste with lid closed. Finally add enough water to the kadai and cook in medium flame for few minutes. Once the kurma turns thickens,drop gently the steamed balls, kasuri methi,cook for few more minutes. Serve hot with rotis and rice..
For our this month's We knead to bake, a monthly baking event started by Aparna of My Diverse Kitchen, she challenged us to make Torcettini di Saint Vincent aka sugar crusted twisted cookies.This sugar crusted twisted cookies are quite particular coz its neither a biscuit nor cookies, but they are yeasted and goes for a bread like dough,thats the reason these cute cookies are yeasted cookies.Torcettini are the smaller version of torcetti which means small twists, this cookies goes for a teardrop shaped twists made with dough of flour,yeast,butter which is shaped and then rolled in sugar before baking. 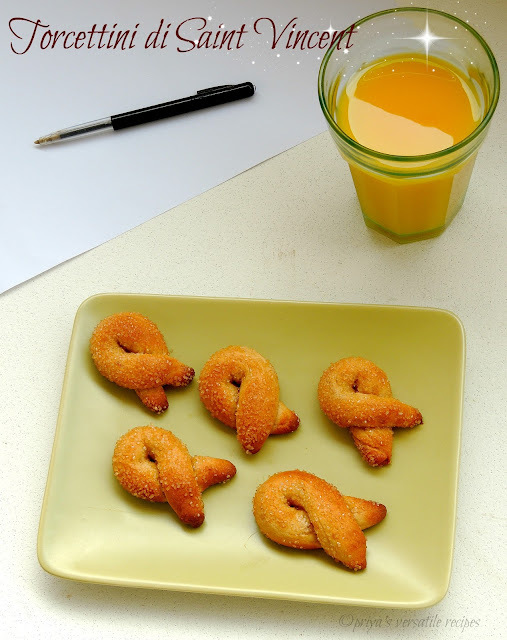 Its seems that the origin of these biscuits is believed that a grissini ( the famous Italian breadstick) baker had some leftover butter which he ended up in adding to the last batch of grissini dough and rolled them in sugar and finally he shaped them into loops, this is how torcetti was born. Torcettinis tastes fabulous when served along with coffee or tea, these cookies will be mild in sugar with a wonderful flavour.I prepared my torcettini with coffee powder and orange zest instead of plain one or with chocolate powder. I rolled my torcettini with brown sugar and they came out extremely fabulous and we couldnt stop ourselves munching these beauties. Today we start our last week of blogging marathon,we have successfully finished three weeks already with three beautiful themes,for the fourth week its going to be crafts or miscellaneous theme.Since craft is not my cup of tea, am going to cover few food events during this whole week.Check out the Blogging Marathon page for the other Blogging Marathoners doing BM#27. Take the flour,salt,coffee powder,orange zest in a food processor, pulse it for few minutes, add the butter pieces and pulse it again until the flour mixture looks powdery. Add the yeast,water and pulse it again to form a ball.Dont over process the dough. Place the dough in a greased bowl, cover it well and let the dough rise a bit. The dough wont really double in volume,it will look puffy after an hour,when you pinch off a bit from the top you can see the interior of the dough looks like honeycomb. Press the dough and deflate it, wrap it in a cling wrap and refrigerate it for atleast one hour. Take the dough out, lightly roll it out into a square, cut into four strips, then each strips as 6equal pieces. Then cut them again to make a total of 24 pieces. Roll each piece as pencil thick rope, sprinkle little brown sugar on your work surface,roll the rope in it, so the sugar crusts the dough uniformly. Form the rope into a loop crossing it over before the ends. 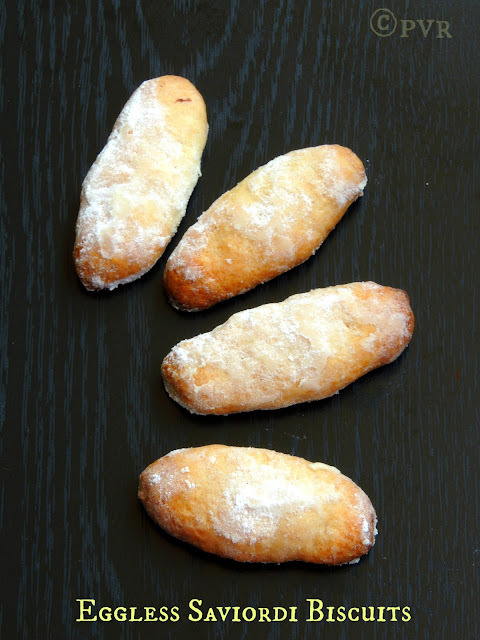 Preheat the oven to 325F,place the rolled unbaked torcettini on a baking sheet lined over a baking tray,leaving enough space between them, leave it aside for 20minutes. Bake them for 25minutes until they gets a nice golden brown crust. Cool them completely and enjoy with your favourite drink. Every vegetable or fruit will have their season and obviously we love to cook maximum with the seasonal vegetables or fruits before their season ends. Today recipe for the seasonal theme of this week's blogging marathon is a simple but yet a prefect post for this week's theme.Mango ginger is a seasonal rhizomes and its a plant of ginger family which is closely related to turmeric, this mango ginger looks very similar like ginger but tastewise they will have raw mango taste. Knobbly on outside and pale yellow on inside this mango ginger suits prefectly for making pickle. 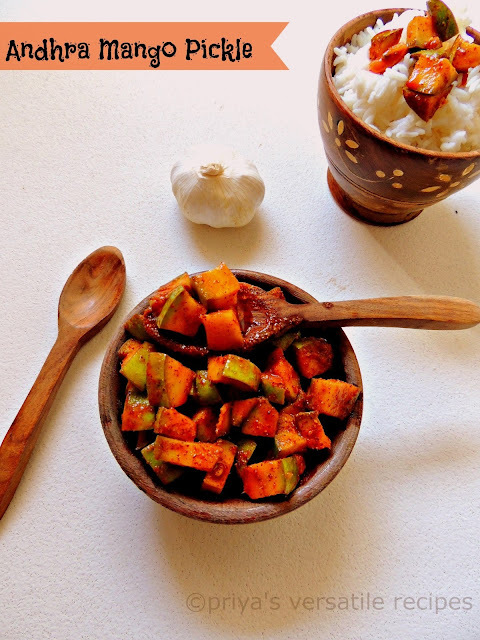 Mostly South Indians will make a quickest version of mango ginger pickle without cooking. Yep just add salt, chopped green chillies,lemon juice and chopped mango ginger,mix and your pickle is ready. This instant pickle goes awesome with curd rice, but my version is also quite a quickest version but this pickle need some cooking. You can enjoy this pickle with anything, they goes awesome with rotis too.Check out the Blogging Marathon page for the other Blogging Marathoners doing BM#27. Heat oil in a pan,once its hot,let splutters the mustard seeds, add the asafoetida powder and fry for few minutes. Add now the grated mango ginger, red chilly powder, salt and cook in simmer for few minutes, finally add the amchur powder,toss it gently. Put off the stove and let it cool completely. Store this pickle in a cleaned, dry airtight container. Stays prefect for a week in room temperature and more than a month in fridge. Enjoy this pickle with rice or rotis. 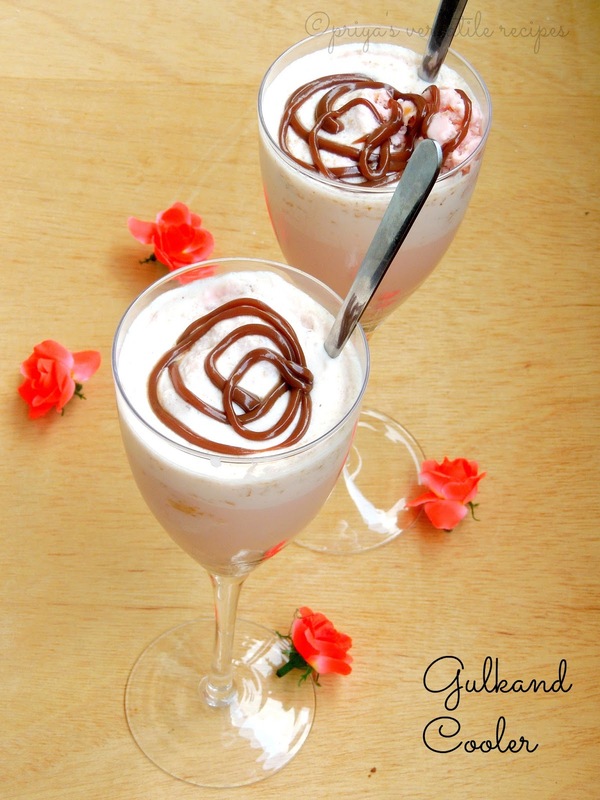 Gulkand cooler, i quickly whipped up this summer cooler with homemade eggless gulkand icecream,rose syrup,almonds and chilled milk. An excellent summer drink,definitely a fabulous cooler to beat the heat. Sometimes i usually make foods quickly but to name it i'll break my head everytime. This time, i didnt break my head and obviously one of my blogger buddy helped me to decide a name for this wonderful drink.Thanks sweet heart else i would have struggled a lot. Finally here comes this beautiful drink, this summer cooler will definitely satisfy your tastebuds and a prefect drink to enjoy without any guilt while its hot outside.Check out the Blogging Marathon page for the other Blogging Marathoners doing BM#27.Sending to my own event CWS-Almonds guest hosted by Preeti of Simply Tadka. Blend the almonds and chilled milk, rose syrup as smooth paste, i didnt strain it. Finally add enough eggless gulkand ice cream and blend for few more seconds. Serve it immediately topped with chocolate syrup. One of the summer drink we never failed to enjoy during summer is this famous nannari sarbath. Actually we can prepare sarasaparilla syrup at home with dried roots. But somehow this syrup is quite available at stores and we usually get it from Indian stores. Coming to my version of sarbath, i prepared it more interesting by adding some badam pisin aka almond gum.Badam pisin is a cooling agent, quite available in herbal medicines shops and its quite different from the goond used in North.Usually this cooling agent is used in famous drink called Jigardhanda,prepared with rose syrup. Sarsaparilla root cools body and thats why they are widely used in summer.It also works as an excellent blood purifier. Sarsaparilla drink naturally cools the body,it is also believed to help skin problems, chronic rheumatism, urinary infection and stomach heat problems. 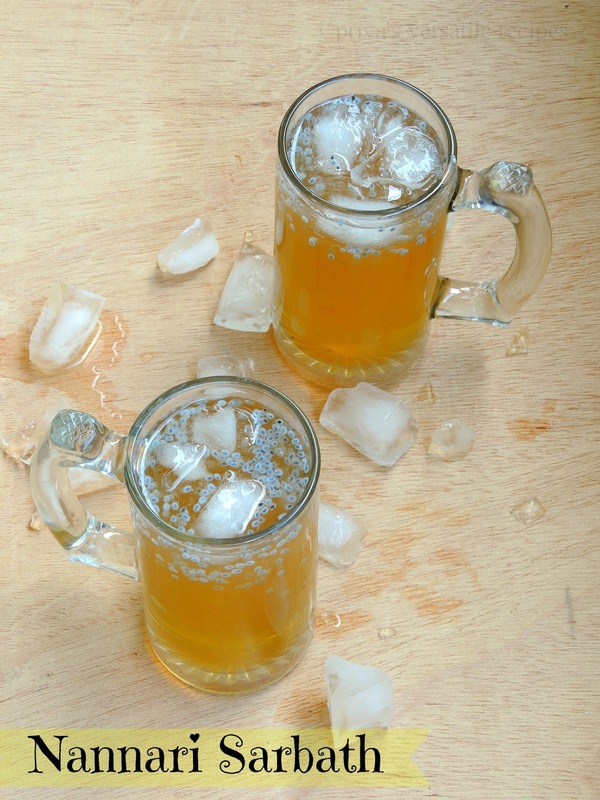 Sarsaparilla drink is an excellent tonic that would refresh the body during extreme heat. Dont forget to prepare this drink during summer and beat the heat with it.Check out the Blogging Marathon page for the other Blogging Marathoners doing BM#27. Take the syrup,soaked sabja seeds, soaked badam pisin in a vessel..
Add enough chilled water, squeeze out the juice from the lemon. Add the icecubes,mix well and serve. No need to add any sugar, since the syrup will have enough sugar. Soak few pieces of almond gum in water overnite and let them sit in room temperature. 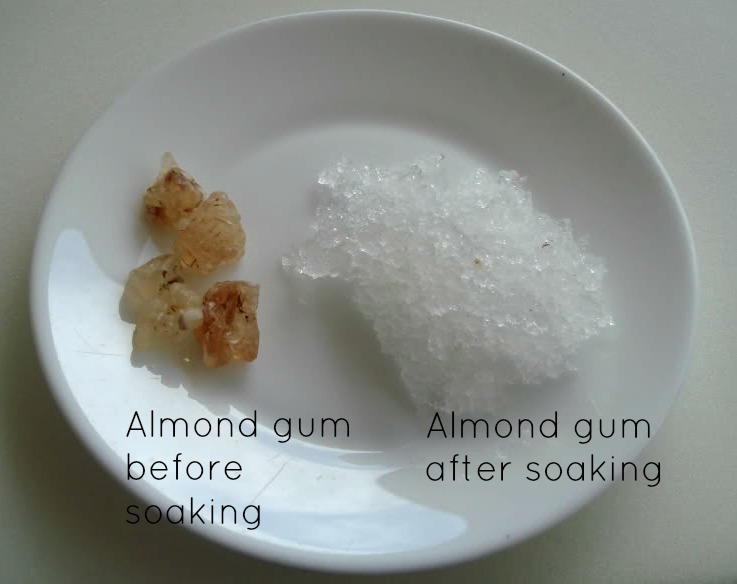 The next day,you can see the soaked almond gum turned as transparent jelly like texture. Drain the soaked water, remove the impurities and wash again. Use it in juices as per need. My readers and followers will definitely know that every 7th and 20th of the month i'll be inviting newbie bloggers from this bloggy world to write a guest post in my space. Today is an another special day for me,yep today's host is a wonderful ,sweet person, before going to know about her, if anyone want to be my guest and if your blog is less than two years please do contact me through Facebook or by a mail with your facebook name to add you in this new adventure. Hope many of you will join ur hands with me. Obviously the motto of this event is to introduce the upcoming new bloggers to this immense virtual world. Coming to today's guest, she is a cute,very bubbly,jovial and very humble person i crossed in this virtual world. If you go through her space, you will be amazed to see how wonderfully she explains the food she share with us, no need to say about her photography skills. Earlier whenever i go to her space, i thought that the person behind this space might be someone who might have so many years of cooking experience.Seriously each and every Divya's posts will have a well detailed description with wonderful stepwise pictures, then slowly we get connected together and then a day i came to know that she is very much younger than me, i was surprised and shocked at the same time, that day i came to know that she is not only younger than me also a beautiful human who have a huge heart.I can talk for hours about her,seriously she is also one among my favourite bloggers i want to meet personally in my life atleast once in my life. Ok ok, i dont want keep the secret any more, today's guest is none other than one of my cheerful,very jovial blogger sister Divya Pramil, who blogs at You Too Can Cook. 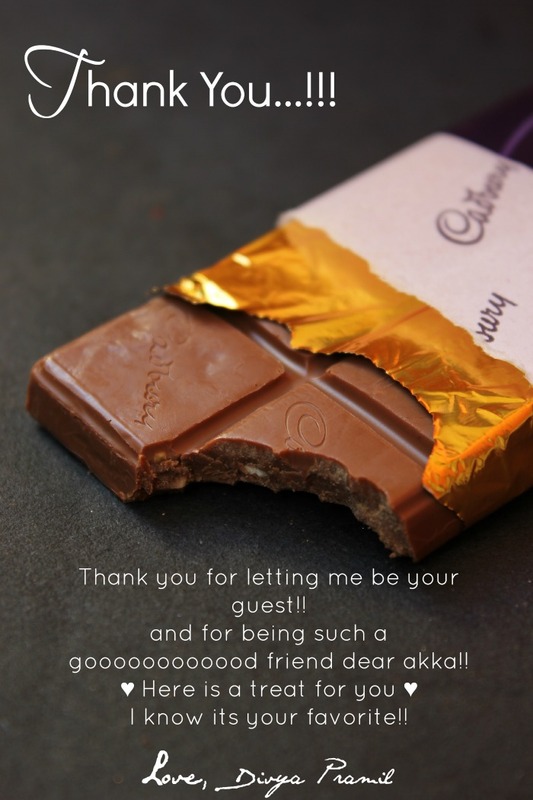 Over to Divya Pramil of You Too Can Cook..
Hello dear friends, am so excited today about doing a guest post for one of my best friend Priya akka. I never knew I will be making one for her and it is almost like a dream come true. Thanks a lot for the opportunity Priya akka. When I first stepped into blogging I found very few consistent bloggers who’d blog regularly with passion. And I spotted out one passionate blogger who stood apart from all the other bloggers with her consistent everyday blogging. Her humble nature has always attracted me to become her friend, but I have always stood aside, thinking that she might not be interested in my friendship. Never in my life did I dream that I would become her friend. She is more than a sister to me and guides and supports me always and anytime I need some help or suggestion she would readily help. I was and am still amazed with her humble, down to earth nature and never give-up spirit. It is none other than our super-woman or duper-blogger Priya Suresh akka. I should mention now about the comments she posts on other blogger’s space, coz those were the first spark that made me like her so much. You can always find Priya Suresh akka’s comments everywhere even in a newbie’s blog. Those comments are not just random words; they are contexts with meaning that relates to the recipes. I had come across many many successful blogging queens who never even bothered to check out a newbie’s blog, I have come across such people too, but I was really amazed with Priya akka’s attitude of supporting even a one month old blog. 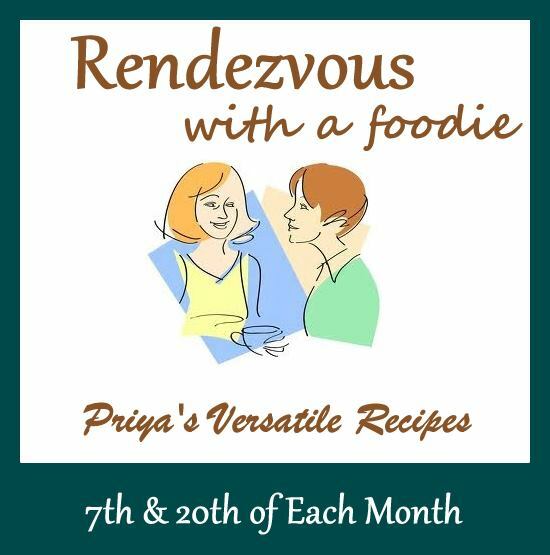 And now recently she has come up with the idea of this Rendez Vous with a Foodie event with an idea to showcase newbie bloggers to her wide range of audience which is really a respectable idea. Though being a busy mom she still posts consistently and puts in so much effort into her blog, I wonder how she manages to post even amongst a tight schedule so fast. Though I do not do much work, I still sit grumbling and complaining about how there is not enough time. But its high-time I learn from this busy bee, the way to manage time!! Kudos to all your hard work, sincere effort, respectable thoughts, friendly and down-to-earth nature. Thanks for being such a support to me and many others. You are a true inspiration akka. Keep rocking as always!! And thank you so much for the wonderful opportunity. When Priya akka announced the event, I readily volunteered, as I knew that this is one good opportunity for upcoming bloggers like me and it would be an homor to appear on her space. But from then I had confusions about deciding the recipe. As you all know she has thousands of recipes, and it was really difficult for me to choose one. I was surfing her space and found many recipes with variations and innovations and it became even tougher for me to decide the special recipe. 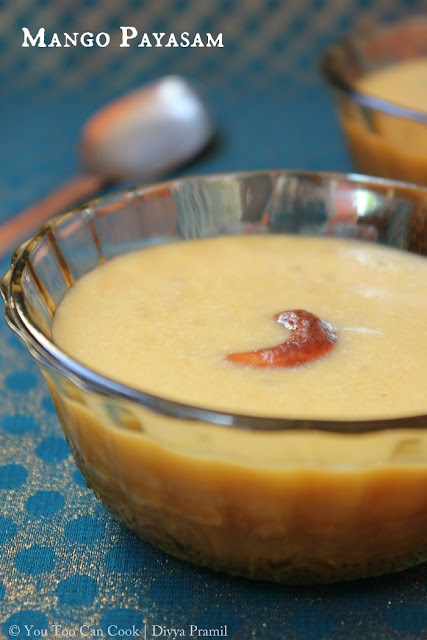 Finally I came up with 3 recipes, a mutton recipe, a vegetarian recipe and this lip-smacking Mango payasam. Mutton and the vegetarian recipe sounded like a day today ordinary recipes and I know that these are not gonna be new to Priya akka. I was satisfied with the third one as it was a bit different from the regular track. And obviously it’s a sweet recipe. We people tend to start everything with a sweet and that has been a sentiment right? and this post fitted the theme; sweet & special. It’s a simple to make but super delicious and creamy dessert recipe that my grandma had taught me when I was a kid. 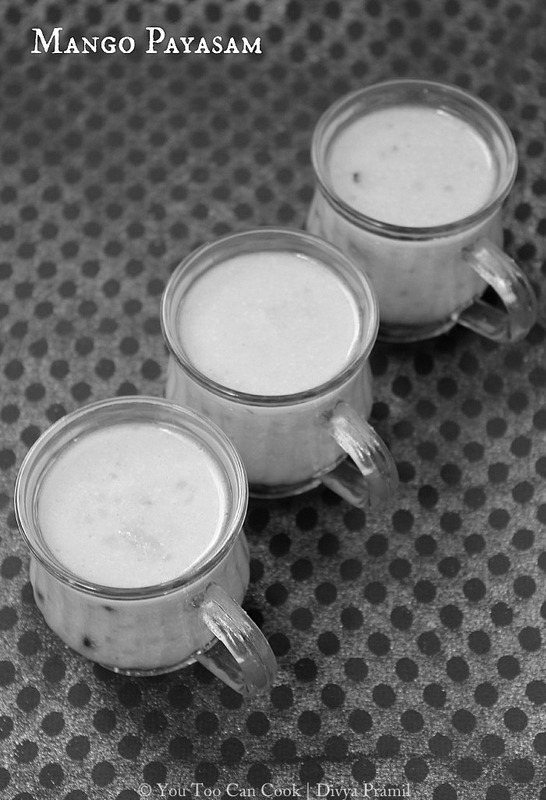 Not a single summer has passed for me without tasting this yummilicious payasam. Hope you like it Priya akka, here is my simple treat for you. 1) Tell us about you and your blog? Hi friends I am Divya Pramil, author of You Too Can Cook. My blog is a year old, fed with many traditional Indian recipes, both Vegetarian and Non-Vegetarian. Am a fan of hot spicy delicacies, so you can find many such dishes at my space. About myself; am a home-maker with unlimited passion and interests in cooking. When coming to relationship, I give utmost importance to people and their emotions, am more on the sensitive side but not on the practical side. I have my own fantasy world that no one can understand and am creative too. When coming to work, I often tend to overdo work, and always I expect a lot of perfection in whatever I do. Am a pet lover and I have had many pets before I got married. I have petted puppies, kittens, squirrels, dove, love-birds and ducks. Am a very easy to go with person and am much on the fun side, I am very patient at times and everyone does wonder how I could be that patient, but rarely I lose temper and they will be the worst. 2)Before and after blogging, tell us how blogging changed your life? Blogging has indeed changed a lot in me. I never knew I would have so many changes in my life. Before, I was more like a lonely individual cooking passionately behind walls, within my limits for my husband, family and friends; I used to share cooking tips and tricks only within a circle. I was not much into photography nor was I so creative in clicking before. I was not much into writing either. I was not even aware of how websites work and the technical work behind it. But now I have started cooking for a varied audience from different places of the world, I don’t even know of. I get recipe requests from my visitors, blogger buddies and I cook recipes and post for them which is a real joy. I have gone much into photography, I keep clicking whatever I see, and I have started loving photography. These days, I write much better not a pro though. I own a blog, a space of my own, where am able to work and exhibit my interests. I spend time more usefully now and am happy that it’s useful to many people out there too. Moreover I have got really good like-minded friends who care for me much more than relatives do. Each one of them are unique but so special and close to my heart. I’ve changed a lot after blogging and am happy for it. 3)When and what motivated you to blog about food? Cooking has always been a passion for me, but I had never ever thought of becoming an author with a space or blog of my own. Though I had internet access I had never tried recipes from blogs or websites and so I wasn’t much aware of blogging those days. But one fine day I was randomly surfing online when I ended up reading about blogging. Immediately I created a blog of my own, without a second thought about what I will be blogging. But I did start the same day with mere confidence; I blogged about technical tips, relationship advises, I even blogged about doing aari work a kind of embroidery. But later after few months I recognized that these are not my niche, so I deleted the old one and started a new blog (my present recipe blog) that I knew would be my specialization. 4)There are tons of blogs/pages on food these days what according to you is the speciality of your blog and the food that you cook? I focus on Indian recipes and many traditional South Indian specials that many are not aware of. These days I have found that even Indian women tend to forget about all the Indian delicacies and switch on to westernized food. I do not want the traditional recipes to fade away from people’s mind. I still have the pride that Indian food is the best and healthiest so I focus much on that, moreover I use easily available ingredients to make my dishes and I try to explain really well. I make it simple enough to make sure that even a newbie can cook well. 5)When its comes to cooking, who is your inspiration? Obviously my mom has been a great inspiration and support. But there was another person who made me fall in love with traditional cooking, my maternal grandma. She was the greatest and my best inspiration; I have stood in awe at her cooking skills and patience many times. Though she is not here with me anymore, I still have what I have learnt from her!! 6) Every newbie blogger faces tons of challenges when it comes to blogging,tell me about one of the challenges you faced and how did you overcome it? please specify with facts and details. I did not have any much struggle. The only things I was very much worried about was about traffic and indexing in early days. I tried submitting my blog to different useless sites and found them to be a waste of time. But then I stopped bothering about all such factors and started enjoying blogging and everything turned out to be good on its own. 7)What is your best recipe and your favourite recipes you have blogged till now? I love most of my recipes, but there are some that I do think are my best recipes;Samosa , Jigardhanda, Heart Shaped Paniyaram, Strawberry rasgullas, Chicken Ghee Roast, Coconut Rice, Red Snapper Curry, Mutton Kheema Curry and many other. 8)Few tips about food photography? For a good photography you definitely need patience. Shoot in daylight, use different props and attractive backgrounds. Keep clicking as much as possible. 9)What is your budget for the props, do you have any or else manage with household stuffs? I do not have any budget nor do I plan to get props. 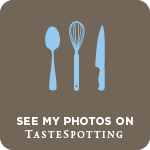 I just purchase all types of culinary stuff that I can use in my kitchen and blog. Most of the times I use my house-hold stuff itself, I had a flair for purchasing beautiful props even before I used to blog, so I had many bowls and props already in my kitchen and this helped me a lot after I started blogging. 10)How do you plan your blog posts? Do you post rarely,regularly or once a week? I do not have any plans as such; I just plan about what to cook and sometimes I don’t. I click the recipes of what comes out well in my kitchen, then save them in my drafts. I try to post regularly or at least once in two days. 1)Do you have any other passions apart from food blogging or blogs you own? Yes I have many other passions other than cooking, I love petting animals. I was once a dancer and I was busy with it in schools and colleges but not anymore. Now I do aari work, a kind of embroidery work with silk thread, jardosis, stones, chumkies on my dresses. I paint or draw at time. I love doing make-ups and hairs do’s, I have participated in competitions too. I earlier had a flair for gardening too, but now due to space constraint have not gone much into it. That’s about me and my passions. Into a saucepan add sago and 200 ml (1¼ cups) of water and place on flame. Cook until the sago pearls turn translucent and soft. 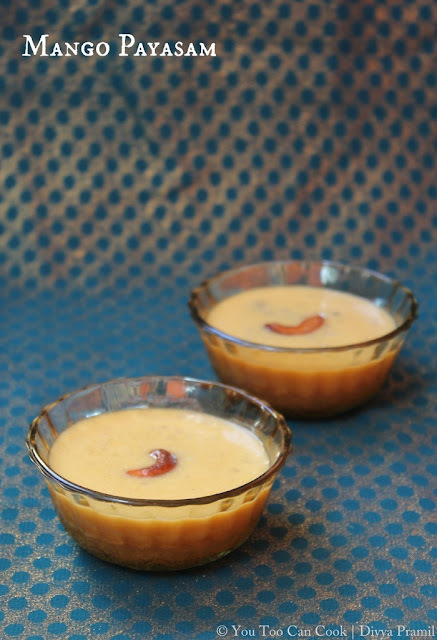 To a spoon of warm milk add a pinch of saffron and set aside. Chop mango pieces into smaller pieces and blend into a fine paste. Place a pan on flame and add 2 spoons of ghee. Then add the crushed cardamom pods saute. Then add the mango pulp and saute on low flame for 3 minutes. Now add the cooked sago/javarisi along with water and stir well. Then add sugar and mix well. After it gets dissolved add the boiled milk and stir well. 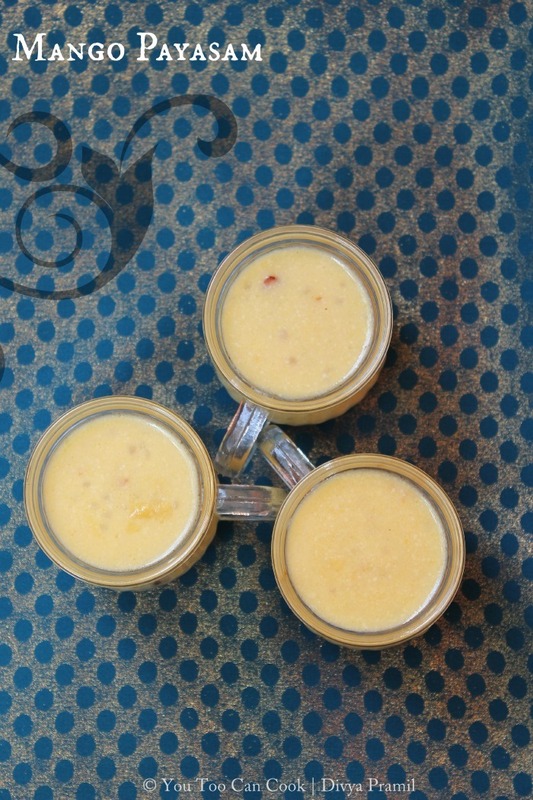 Now take the saffron soaked milk and press the saffron well using your fingers, then add it into the payasam along with the milk and stir well. Cook on low flame for few minutes or until it thickens. Now heat another pan drop 2 spoons of ghee and add cashews, saute until it turns golden brown, then add the raisins; after it puffs up, remove from flame and add it into payasam. Remove payasam from flame and serve warm or chilled. TIP 1: You can add some milkmaid to the payasam to make it yummier. TIP 2: Use ripe and sweet mangoes to get the best flavors. 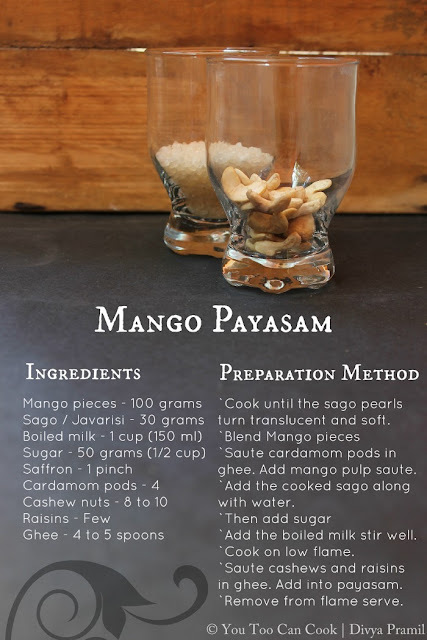 You can also make this payasam without sago. 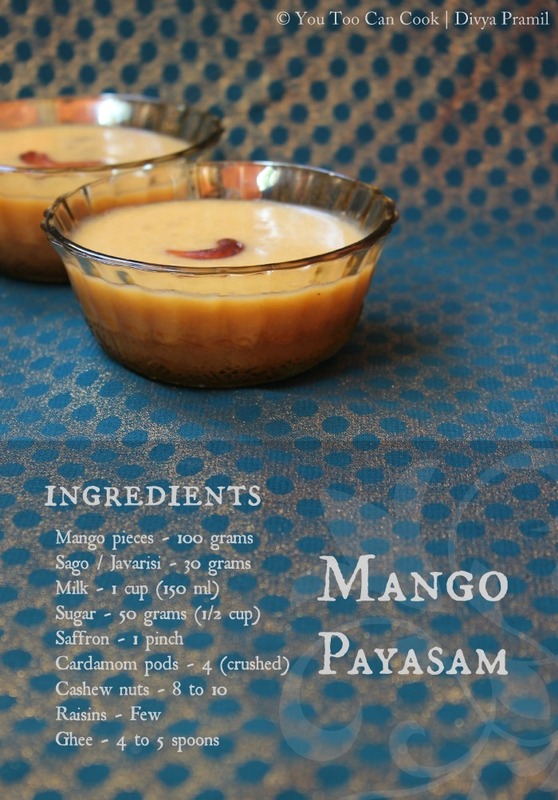 Lip-smacking Mango Payasam is now ready!! Thank you so much Priya akka for the opportunity, loved making this post for you!! Hope you will enjoy this delicious desser from Divya, stay tuned for an another guest post on 7th May..Till then bye from me and Divya. Cauliflower is one of our family favourite veggie, cook it either in steam or in curry everyone at home will definitely enjoy this veggie. Actually cauliflower season is between november to may here, but thanks to frozen section we get this cauliflower florets easily anytime. Have you ever tried combining both cauliflower and channa?? if not give a try..I cooked this beautiful dish today for our lunch and served along with rice and kurma. With leftover gobi channa, i quickly finished them as this super filling wrap with some homemade chappathis.Obviously our dinner was this fantastic,protein packed wrap. To make this gobi channa more flavourful and healthier, i added some kasuri methi.A super satisfying and definitely a healthy wrap to carry if you are planning for a picnic.Check out the Blogging Marathon page for the other Blogging Marathoners doing BM#27.Sending to Only Legumes guest hosted by Nalini,event by Pari. Heat enough oil, let crack the fennel seeds, add immediately the chopped onions and ginger garlic paste, saute until the onions turns transculent. Add now the chopped tomato pieces and cook until they turns mushy. Cook everything in simmer until the oil get separates from the masala. Immediately add kasuri methi, toss gently until the masala gets well mixed, cook everything in simmer for few minutes and put off the stove. Cook the already prepared chappathis on both sides until they get well cooked. 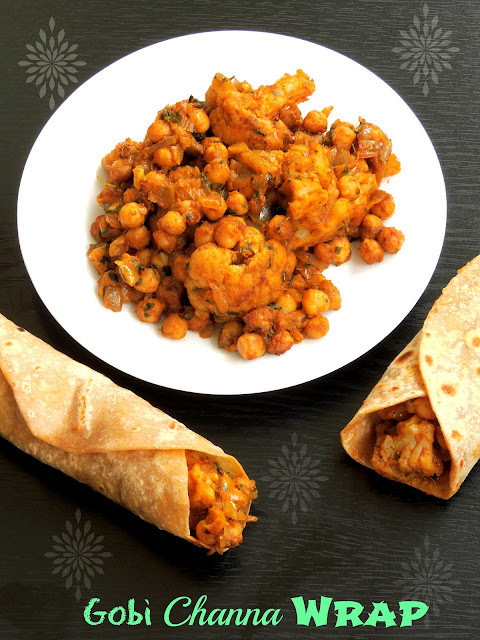 Place enough gobi channa in chappathis, roll them as a wrap and enjoy. Green apple aka granny smith is one of my favourite apple,this apples might be very tart, bright in appearance and crisp while biting. Best for peoples who like tart apples rather than the sweet ones.These apples are certainly tasty and very juicy with many more medicinal values. An apple a day keeps the doctor away, quote reminds me always the juicy red apples but these tart green apples too have more health benefits like the red ones. We get apples from September to March here, but between october and december its a peak season for granny smith.Mostly i'll prepare this apples as salads,soups or i'll have these apples simply with salt and chilly powder for snacks. After a long hesitation, finally i tried my hands in making an instant,mildly tangy and delicious green apple relish. You can have this relish with rice, idlies,dosas or else just as a spread with bread slices.This instant green apple relish stays prefect for two days in room temperature and for more than 10days in fridge. If you get abundantly green apples dont forget to make some,am sure you will definitely love this delicious relish.Check out the Blogging Marathon page for the other Blogging Marathoners doing BM#27. Squeeze out the juice from the grated apples and keep aside. Heat enough oil, add the mustard seeds, let it splutters, add immediately the asafoetida powder, fry for few minutes. Add immediately the grated apple and saute for few minutes. Now add the red chilly powder, mango powder, salt and cook in simmer for few minutes until the oil gets separates. Finally add the lemon juice and put off the stove. Let the relish gets cool completely and store it in an air-tightened bottle. Enjoy with your favourite food. Even the weather in Paris is between sunny,rainy and windy, we love to have a glass full of healthy shakes. We love dried fruits, needless to say we never stop ourselves munching them, i'll try atleast to feed my kids daily with dry fruits. But sometimes its quite a hard task for me to feed them, so i'll mix and match according to their mood. Dates and raisins, they just hate it to the core,obviously i'll grind and mask it in many of my bakes but thank god my kids just love dried figs. Dried figs is full of goodness and its rich in iron,calcium,potassium,zinc,copper,phosphorus.Figs can be eaten fresh or dried and they are usually used in making jam. Figs have a laxative effect and contain many antioxidants. 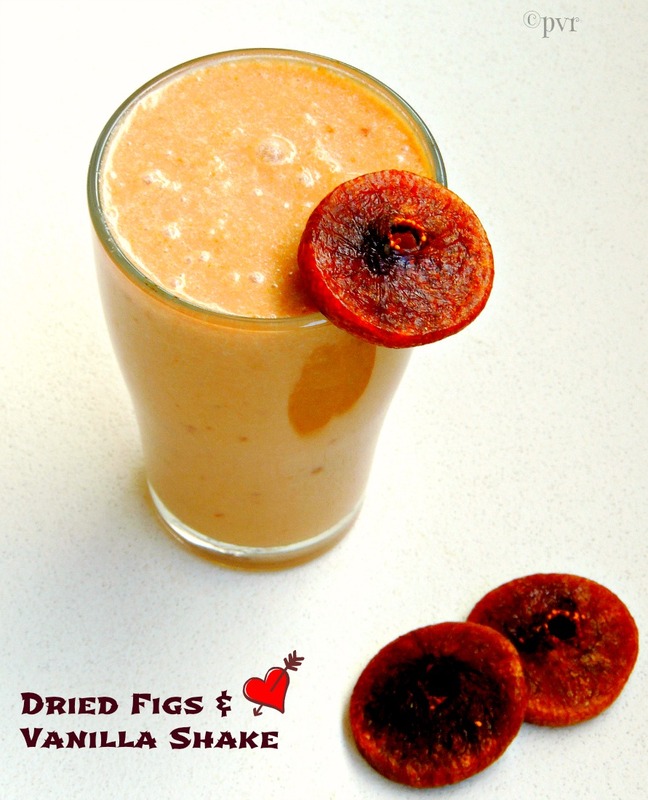 Somehow the dried figs are the most commercial product than the fresh ones,these fruits are rich in fiber than most of the fruits and vegetables.You can feed very well your kids with this incredible dried figs, if they dont like just make this kind of refreshing shake and am sure they will just love it.You can even serve this delicious shake for a summer breakfast to kick start a hectic hot day.Check out the Blogging Marathon page for the other Blogging Marathoners doing BM#27. Soak the dried figs overnite in a warm water. Next day, blend the soaked figs,chilled milk,vanilla icecream and honey as a thick shake. Every summer, we wont keep ourselves away from making pickles, most mango pickles. Summer is the season where we will get abundantly variety of mangoes and every year we wont forget making mango pickles. Andhra style pickles always have their important place, these pickles are well known for their varieties of pickles with mango, sorrel leaves,tomatoes and chillies. I always want to learn Andhra style sorrel leaves pickle but somehow its kinda hard task for us to get super fresh sorrel leaves here. But am somehow happy to get super fresh raw mangoes now in Indian grocery and this time i picked some raw mangoes just to make some Andhra style pickle and tried this tongue tickling raw mango pickle. I tried Prathy's Mukkala pachadi/Raw Mango Pickle , since this pickle goes for instant version i prepared them few weeks back at home. They turned out extremely delicious,hot and spicy. 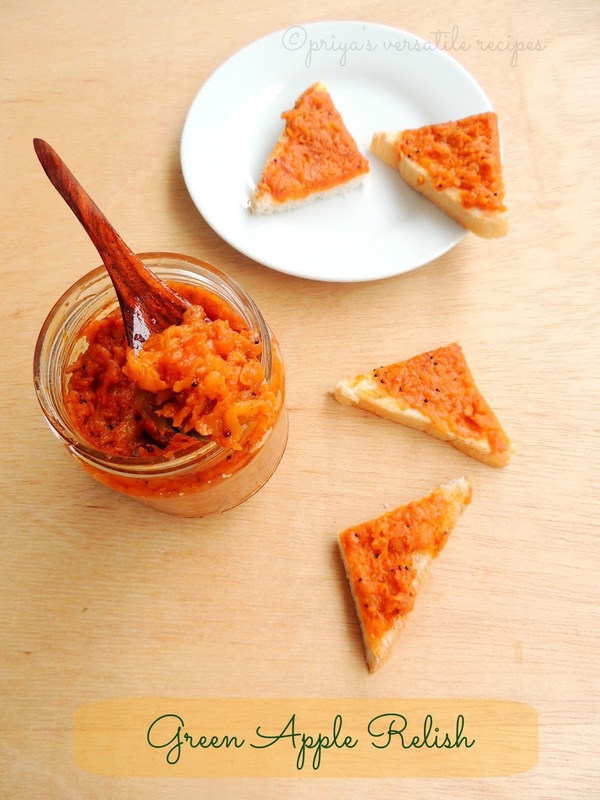 An incredible pickle to enjoy thoroughly with curd rice, and we finished very quickly. Am gonna make again this pickle next week as i picked again some super fresh raw mangoes from Indian stores yesterday. This is my second post for this week's blogging marathon with seasonal as theme..Check out the Blogging Marathon page for the other Blogging Marathoners doing BM#27. Wash thoroughly and wipe the mangoes with a dry cloth, cut it as small pieces with the skin. Spread them on a dry cloth to dry them for an hour. Dry roast the methi seeds,mustard seeds for few minutes, let them cool completely and grind them as powder. Heat the sesame oil until it gets warm,cool the oil completely. In a large bowl, take the red chilly powder,mustard-methi seed powder,salt and mix them well. Now add the mango pieces to the spice powder, mix well until all the pieces gets well coated with the spices. Take the spice coated mango pieces in a clean air tightened bottle, add the cooled sesame oil to the mango pieces,mix well. Cover it with the lid and keep aside for an hour. Enjoy this mango pickle from the second day, this pickle stay for a month. Use clean spoon for serving,handle this pickle carefully. I do prepare sprouts at home whenever i feel like cooking with sprouts, one of the most common sprouts i like to make and cook with is the famous protein packed green moongdal sprouts. I prepared few green moongdal sprouts last weekend at home and prepared with them these beautiful crispy vadas for the Tamil new year celebration. Seriously this vadas are simply awesome, tastes exactly like our usual channadal masal vadas. They goes awesome as side dish as well as an excellent evening snacks when served along with some spicy chutney.Sprouted moongdal suits tremendousmy awesome for making this healthy fritters,yep since they have prepared with sprouts eventhough they are deep fried, these vadas are definitely healthy.We couldnt stop munching them and enjoyed along with sago kheer. Grind the sprouted moongdal as coarse paste without water, if its too hard to grind,just sprinkle some water. Add the chopped onions, chopped green chillies, chopped ginger pieces,crushed garlic cloves, curryleaves, fennel seed powder and salt, mix everything well. Meanwhile heat the oil for deep frying, take a small ball from the grounded sprouted moongdal mixture, flat them in your palms and gently drop them in hot oil. Fry them until they get well cooked, strain the excess of oil with a paper towel.. Serve hot with spicy coconut chutney. Summer is yet to come here, but some healthy summer drinks are always welcome at home.Here we start again a week of blogging marathon with seasonal as theme. Obviously Amla aka gooseberries are seasonal here and they have so many health values.Indian gooseberries are eaten as raw, and also cooked in many other ways, the most famous is the amla pickles. We get rarely amlas here and its quite expensive here when compared to India, obviously i get rarely and use them immediately.This time without any hesitation i tried making a summer drink with fresh amlas. This lemonade is definitely a thristy quencher, body cooler and definitely a healthy drink. 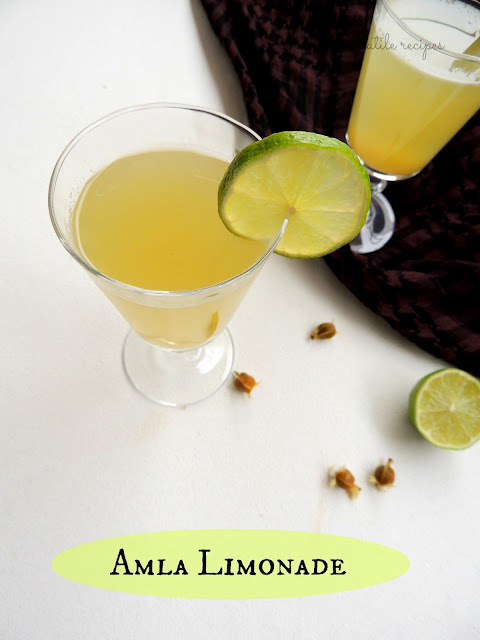 If you get amlas abundantly dont forget to give a try to this refreshing lemonade.Check out the Blogging Marathon page for the other Blogging Marathoners doing BM#27. Remove the seeds from the gooseberries and grind as fine paste with enough water. Extract the juice from the grounded amla paste. Meanwhile squeeze out the juice from the lime and mix the lime juice, amla juice together in a vessel. Add sugar and enough water to the juice. Add icecubes and serve immediately. I need to give a break to my traditional Rajasthani dishes i have been showcasing since a week in my space for blogging marathon. For the last day of blogging marathon with traditional dishes as theme, am posting here a delicious traditional Kashmiri sweet dish with rice. 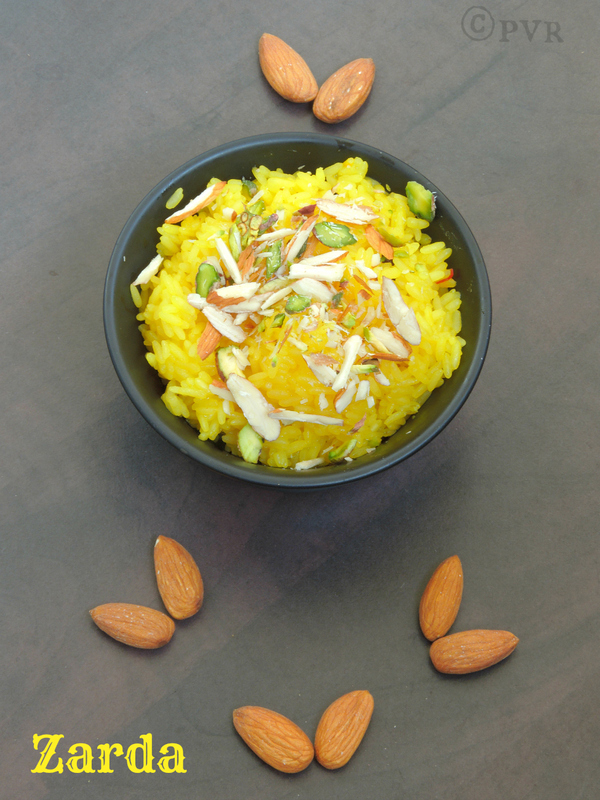 This Zarda is a sweet saffron rice dessert in which rice is cooked with sugar syrup,milk,saffron and nuts. Muslim community named it as Zarda eventhough this dish is well known as Meethe chawal in North India. Obviously this dish is a fantabulous and royal treat for peoples whoever loves sweet rice.Srivalli challenged this Zarda for this month's Indian Cooking Challenge and this dish is suggested by Vaishali.Thanks to both, seriously i loved this flavourful dessert and a prefect feast for my sweet tooth. If you are bored of usual sweet rice, dont forget to give a trial to this rich Zarda, am sure you will definitely love this.Check out the Blogging Marathon page for the other Blogging Marathoners doing BM#27. Wash and soak the rice for 15minutes.. In a pan,make a sugar syrup with sugar covered with enough water. In a heavy bottomed pan, heat the ghee, add the cinnamon,cloves and cardamom, fry for few minutes. Add immediately the drained rice and 2cups of water..
Once the water starts drying add the sugar syrup,milk,yellow food colour and saffron strands, cover and cook in simmer. Heat a tsp of ghee and roast half of the nuts, add it to the cooking rice. Once the rice is cooked, put off the stove. Garnish it with remaining nuts and serve. You all know that am running a week of blogging marathon with traditional dishes as theme for this week and i chosed Rajasthani cuisine, already i have posted few numbers of delicious dishes from this cuisine. Seriously am amazed the variety of foods this cuisine have and each and every dish is simply awesome and definitely healthy as well as quick when compared to most of the South Indian dishes. 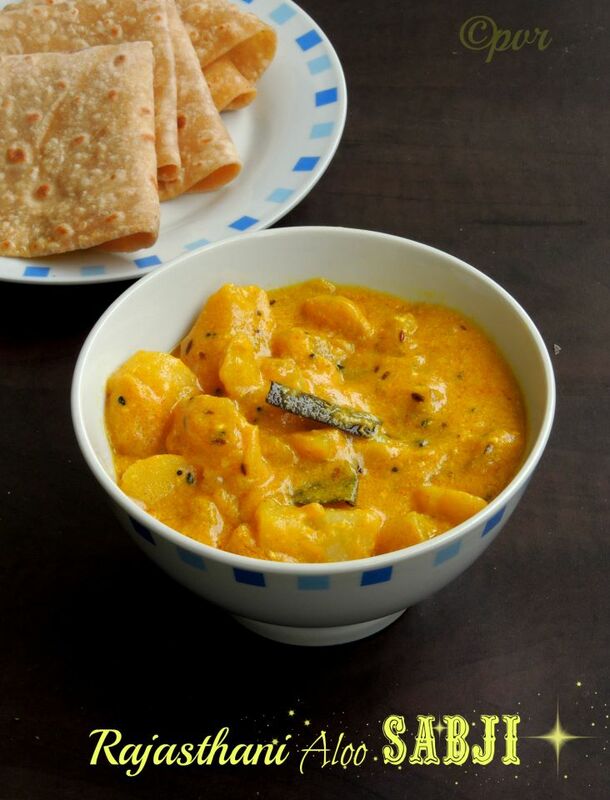 My today's Rajasthani dish is this aloo sabji, this is one among my recent favourite and it takes hardly less time to get ready and goes prefectly as side dish with rotis.I prepared this sabji yesterday and serve with pulkhas. Both works wonder and we had a filling and satisfying lunch sterday. The original recipe is from Madhuri's space.Check out the Blogging Marathon page for the other Blogging Marathoners doing BM#27. Add the gram flour in yogurt and give a mix..
Heat enough oil in a pan, add the mustard seeds, let it splutters. Now add the cumin seeds,fennel seeds,kalonji,cloves,cinnamon,bay leaf and asafoetida powder, fry for few minutes. Add now the gramflour-yogurt mixture and bring it to boil. Add the cubed potatoes,salt, mix well, add a cup of water and cook in simmer for few minutes. Put off the stove and serve with rotis.